Vince Staples is one of the hottest new rappers out right now. Hailing from Long Beach, California at the young age of 23, he’s made quite an impact in the rap genre. His first bit of name recognition came from from his features on Odd Future albums, which he then followed up with a collaborative mixtape with fellow rapper Mac Miller. His debut album, Summertime ’06, was released in June 2015, to widespread critical acclaim, and later that year, he was chosen for XXL’s Freshman Class. His second studio album is scheduled for release on June 23rd, 2017, and is titled Big Fish Theory. The song “Big Fish” is the second single from that album, and its music video was just recently released on May 18th, 2017. 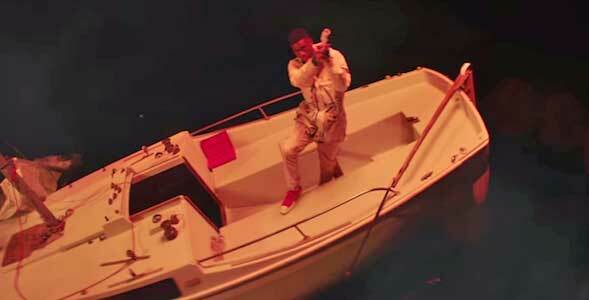 The video takes place on a sinking boat in the middle of the ocean. The song features rapper Juicy J on the hook, and Vince rapping on 2 verses. The beat sounds like it was processed underwater which adds to the songs title and video. Vince raps about how much hip-hop has changed his life, and how far he has come. The title “Big Fish” stems from Vince now being a big fish in the rap game. While he’s thankful for his success, he’s mindful that he still has a long way to go, and that there are always bigger fish in the sea around him. Vince wears a pair of red chucks in the video. 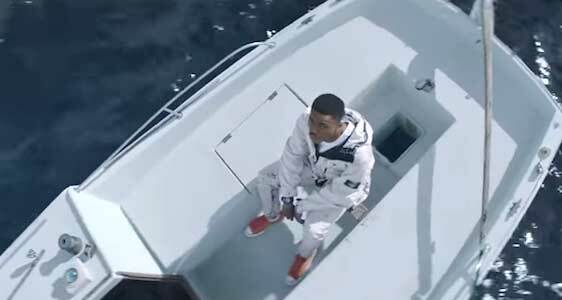 Vince Staples’ music videos are known for how they play with color. He usually goes for a black and white aesthetic, which allows him to highlight specific colors to make them pop. However this video is shot in color, yet Vince is still able to highlight colors and create cool images. Vince is dressed in all white except for his shoes which are a pair of red chucks. His boat is also all white, and the ocean is a deep, dark blue. All these solid colors really make his red chucks stand out. The color red plays a factor later, as the flare that he fires off for rescue is also red. This illuminates the pitch black sky in a blood red hue that creates a really cool image. Throughout the video, Vince is sitting on a sinking boat in shark infested waters, showing that while he may be a big fish, there are still plenty of bigger fish coming for him that he has to fend off. This video contains a lot of cool images and metaphors, and is a great way to start Vince’s album release cycle. The blue and white create a cool tone throughout the video, so when Vince shoots a red rescue flare, it gives the video new warmth.